The Austrian construction company increased its output volume by 26% in the traditionally weak first three months of the year. Operating result improved marginally to € -145.38m. After a solid first quarter 2011, Strabag SE raises its outlook for the financial years 2011 and 2012. According to the new forecast, the group expects an output volume of € 14.0bn in 2011 (previous target: € 13.5bn). Earnings before interest and taxes (EBIT) are forecast to increase to € 320m, after € 295m had been predicted. For 2012, the company had expected an output volume of € 13.7bn and an EBIT of € 300m, while now it reckons with an output volume of € 14.3bn and an EBIT of € 330m. 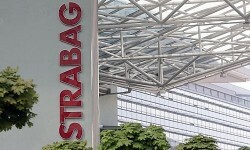 Today, Tuesday, Strabag had released the figures for the first quarter 2011. The company generated an output volume of € 2,309.25m in the first quarter of 2011, which corresponds to an increase of 26%. In the comparison period of the previous year, construction activity had been greatly restricted by unfavorable weather conditions. Growth of the construction volume was witnessed across all segments, though it was particularly strong in the Transportation Infrastructures segment. A country-level view reveals significant increases in Germany, Poland and the northern European markets. The consolidated group revenue reached € 2,210.04m in the first three months of the 2011 financial year, compared to € 1,788.45m the year before (+24%). The order backlog was not enough to reach the record high of the previous year’s first quarter; with € 15,176.99m, this figure was 3% lower on the year. This can be attributed for the most part to the cancellation of the projects in Libya due to the political unrest in that country. Also striking is the increase of the order backlog in Benelux as well as the reduction in Poland and in Hungary. While large infrastructure projects are continuously completed and transformed into output in the boom market of Poland, the impact of public-sector savings efforts can be seen in Hungary. The EBITDA (earnings before interest, taxes, depreciation and amortization) was more strongly negative than in the first quarter of the previous year, amounting to € -59.80m. This can be explained by the extraordinary write-up through profit or loss for Czech railway construction company Viamont DSP a.s. of € 24.60m in the previous year reported in the result from associates. The EBITDA margin, however, changed only slightly from minus 2.6% to minus 2.7%. The depreciation and amortization fell by 18% to € -85.58m – in part related to a one-time goodwill impairment in the amount of € -14.00m performed in the first quarter of the previous year related to the Viamont transaction. The EBIT therefore remained relatively stable at € -145.38m, although for comparison purposes the previous year’s EBIT of € -149.89m would have to be adjusted by the positive one-off effect of € 10.6m from the Viamont transaction. The EBIT margin improved from minus 8.4% to minus 6.6% in the face of the rising revenue. At € -3.21m, the interest income in the first three months was far less negative than in the same period of the previous year (€ -14.51m). While interests remained more or less unchanged, the exchange rate losses from the conversion of internal group financing did not apply. The pre-tax result was € -148.59m, compared to € -164.40m in the first quarter of 2010. The negative earnings after taxes was improved by 9% to € -116.87m. While third-party shareholders still bore a loss of € 10.82m in the first quarter of the previous year, the earnings attributable to minority shareholders this year even amounted to € +0.66m. This results in nearly unchanged consolidated losses of € -117.53m (previous year: € -117.83m) and an unchanged result per share of € -1.03. The balance sheet total on 31 March 2011 fell short of the € 10bn mark as expected, landing at € 9,920.34m after € 10,382.16m at the end of 2010. The reduction of the current assets is due to the seasonally lower current trade receivables. Current liabilities were down as well as a result of the lower trade payables, which were also affected by the winter break. The equity ratio showed little change, settling at 31.8% after 31.1% on 31 December 2010. The net cash position fell significantly from € 669.04m to € 268.90m in response to the build-up of the working capital. The cash-flow from earnings stood at € -78.05m, less deeply in negative territory due to an improved net income. As expected, the advance payment for the Polish motorway project, which had significantly influenced the balance sheet at year-end 2010, has already been partly reduced. At the same time, however, there was no similarly strong reduction of trade receivables as in the first quarter of the previous year, leading to a corresponding build-up of the working capital and a cash-flow from operating activities of € -294.12m. By way of comparison, this value stood at € -117.35m in the first quarter of 2010. Enterprise acquisitions, for example in Switzerland, with simultaneous reduction of the investments in property, plant and equipment and in intangible assets led to a cash-flow from investing activities of € -119.74m. This figure grew by just 4% compared to the same period of the previous year. The cash-flow from financing activities, in comparison, doubled to € 28.42m and can be attributed almost exclusively to the higher bank borrowings.